We have covered the ways we get our ideas together from many people into one plan. Using either brainstorming or workflow tools. The next step, convincing parties outside of our group, that this is a great project, can be difficult. Using Keynote, we put together presentations but even then there is a rhythm that is hard to represent so other teams can see everything start to finish. Several weeks ago, we started using a few of the Movie Storyboard options for the iPad. It has given us the ability to put the people in the meeting into the daily workflow we are proposing. One, Storyboard Premium, has been showing up in the meetings more often. The strength of the app is it’s ability to do more than present pre-created stick figures. Storyboard Premium allows for story boxes to be created with a variety of ‘people’, who can be faced (body and head) as needed. As well, the clothing options makes it so it is easier to represent who is the office person and who the customer is. There is also choices for if the person is standing, sitting, walking, running, arms straight, bent… and the list goes on. Since Storyboard Premium has a ‘layers’ feature, it is possible to set up each person and the background independently. This is important since the first pass at a storyboard is never quite perfect, there will be moving people around and changing the background to best delivery the message. When you have the workflow as you like, you can view the images one at a time or as an overview of 6 so the meeting attendees can see the flow of your deliverable. There is a slight negative in here we should mention, you can’t re-order the flow of the images. Storyboards Premium offers all of these great slide tuning but the order the slides appear are set, no drag-drop arranging. A solution that we are using until this gets fixed is Corkulous. 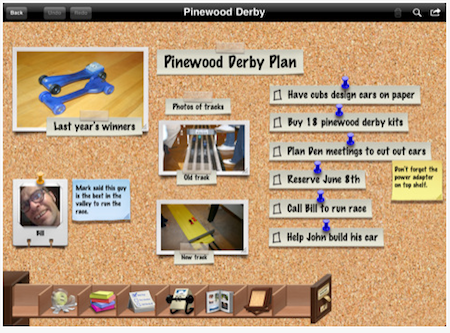 The app is a huge corkboard that we put up images, drawings and text on. Moving things around till we get it right and then create the Storyboard. Corkulous doesn’t export in a way that it can be used to do the actual storyboard presentation but it great for the team to shuffle ideas until it is right. So far, we are getting the go-ahead more often with people seeing everything end to end so we’ll live with having to use two apps.